What was life like for black people living in the Old Edgefield District, South Carolina during the time leading up and following the Civil War? 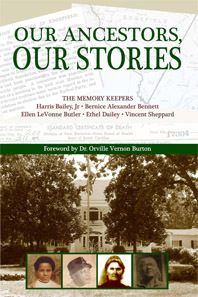 Our book–Our Ancestors, Our Stories–chronicles the history of blacks in Edgefield and the journey of one historian and four individuals and their families who lived in this community. They were our ancestors, our flesh and blood. Obviously, the life and circumstances of African Americans during these times were difficult beyond our imagination today. Yet, our ancestors, like so many others in the community, found ways to survive the hardship of slavery, Reconstruction and Jim Crow to raise their families. As African American authors (The Memory Keepers), we share the journey to honor our ancestors and tell their stories. The lives of individuals who lived in Edgefield, South Carolina will come to life as each chapter in the book evolves into a story for the reader. The authors discovered Edgefield as their ancestral home through researching their genealogy. Through these stories, the rich value of using primary and secondary sources become evident as each discovery examines relationships in the home, the neighborhood, and the community.